With the New Year finally here, Branding Personality is heading in a new direction to reach out and teach business owners about the benefits of Social Media within the Restaurant industry. We have written blog posts on the subject and have a Free Ebook for you to download to learn about the benefits of implementing a Social Media Strategy for your Restaurant. These are all great resources to read but wouldn’t it be better if I showed you a real life example of how Social Media has actually increased foot traffic to one unique new place? During my travels home for the holidays, I had heard about this new yogurt place that just opened up its first location, right in my home state of New Jersey. 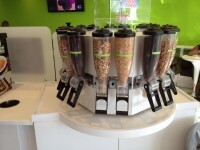 It’s called Let’s YO Yogurt, and it’s located at 450 Union Hill Road in Marlboro, New Jersey. 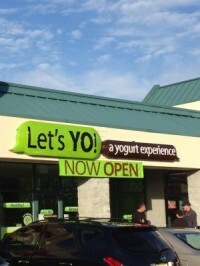 What makes Let’s YO Yogurt so unique is its ability to use social media as a catalyst to grow its business. By tapping into social media platforms such as Facebook, Twitter, and Foursquare; Let’s YO Yogurt has been able to create a real connection between its customers and brand. This connection doesn’t just stop online, what really makes this yogurt place unlike any other I’ve ever seen, is in its ability to use the actual brick and mortar location to promote their social media campaigns. Let’s YO Yogurt has been able to capture its audience through social media and by updating their promotions regularly on their social media profiles people keep coming in for more. They even have a Name Game on Facebook where one name is chosen each day, and anyone who comes in with that name gets 50% off their cup! The place is a self serve place. First you head towards the back to pick out your cup size, then you can select as many different flavors as you can fit into your cup. 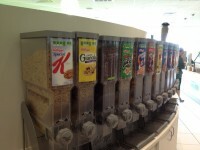 You can then add an incredible amount of toppings starting from your standard sprinkles all the way to fresh fruit, with just about everything you can imagine in between, including cereal! Then you take it to the counter to be weighed, and then pay according to how much you packed in there! There are also smoothies available if you are in the mood for a delicious frozen drink. 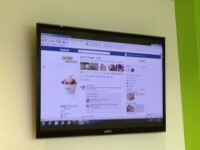 Let’s YO Yogurt has definitely embraced the power of social media and it seems to be working immensely in its favor. With over 30 locations sold and waiting to open in three states, the Let’s YO Yogurt franchise is definitely on the right track to success. If you think your restaurant could use a social media make-over and become more like Let’s YO Yogurt in 2012, Fill out the form on the right of this post TODAY and let us help you get your marketing strategy going in the right direction so you too can enjoy the benefits of social media that Let’s YO Yogurt has seen! I think this is the first small restaurant that I’ve seen do this; none of the ones in my area are really taking advantage of what social media has to offer. They start a Facebook page, but don’t really use it. Thanks Kimberly! Yes, when we read about this online, we just had to take a look and see for ourselves how they were doing it, and what we can learn from them. Thanks Amit! Hope you enjoyed the article! Excellent example of making social media part of the core brand, instead of a tech-oriented appendage. Thanks Michael! I totally agree with your statement. I think more restaurants need to take action to make sure that Social Media is part of their core brand and not just an add-on. Many brands and restaurants have a few social media profiles but don’t do enough to take full advantage of them. 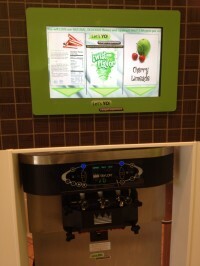 Let’s YO Yogurt has fully embraced social media and as you can see it has worked wonders in their favor. Thanks for input Michael! Sounds great, I love it, especially the use of iPads! Thanks Clive! The Ipads are an ingenious idea. 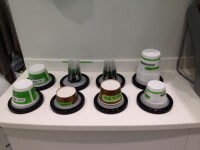 They enable customers to Check-in on their social media profiles to let everyone know where they are, while also giving them the freedom to surf the web and read the news while eating their yogurt! I expect to see more and more places in the near future installing Ipads for customer use.